Uniblue SpeedUpMyPC can help you identify what’s causing your PC to slow down. You can fix all your speed issues to finally have an optimized, cleaner, and faster PC. What does Speed Up My PC do? With so many different settings, files and processes to monitor, it is hard to identify just what is slowing you down, let alone implement the necessary technical adjustments to recover speed and performance. 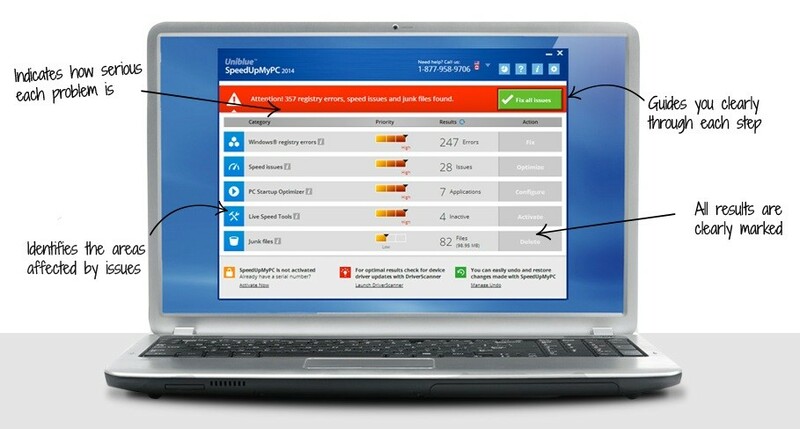 SpeedUpMyPC scans your computer to identify any issues hindering speed, before wielding a powerful range of tools to optimize your system for improved performance. Invalid registry entries are removed and unused processes deactivated to improve system responsiveness. The result is a computer that works faster and better. How many registry errors does your computer have? You no longer need to guess… the free system scan will give you a detailed diagnosis and deep scan of your registry for errors. Have you noticed that the longer you have your computer, the slower it runs and the more it crashes? Often this phenomenon is caused by problems in the Windows® registry that occur over time. Installing and uninstalling programs leave behind fragments – stray files, orphaned startup tasks and corrupted drivers. Over time the registry starts to get bogged down and conflicts emerge. Left unchecked, your system will become increasingly unstable, run more slowly and crash more frequently. RegistryCleanerKit is the easy answer to your registry problems. It conducts a deep scan of your registry to identify problems and errors that can cause system crashes. It will keep your registry clean by removing problematic registry entries and restoring system stability. A few minutes can save you months of frustration and crashes. keep your PC secure without slowing it down. There has been a lot of talk about Windows 8.1’s new features like the return of the Start button. But there are some features and changes that have been mostly ignored. Here are some lesser-known features and changes that will affect the way you use Windows 8.1. Some good some no so good. Windows 8.1 has many controls to set what data and devices are used by apps from the Windows Store (many of which make great desktop apps). For example, you can allow or block apps from accessing your name, picture, and account information. You can turn off your advertising ID so that advertisers can’t use your data to display personalized ads. You can also control in detail which apps use your location data. Last but not least, you can set which apps are allowed to use your webcam, microphone, and other devices. All these settings can be changed from the Privacy section in PC Settings. Compared to Windows 8, all of these controls are a big step forward and provide users with the tools they need to control what data is shared with the apps they’re using. Microsoft didn’t really brag about the new VPN connection wizard in PC Settings. 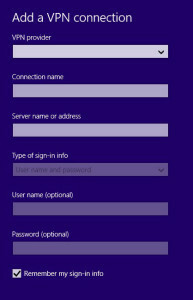 The VPN connection wizard found in Settings > Change PC Settings > Network > Connections > Add VPN Connection provides more customization options than earlier version. The most important novelty is that you can set the VPN provider, and it has built-in support for many providers. 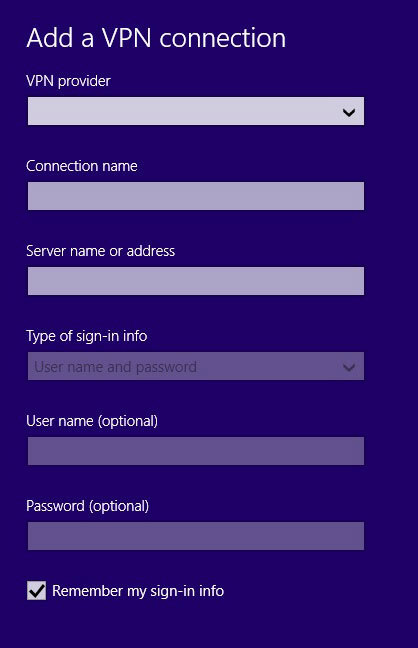 Windows 8.1 also prompts you to sign into the built-in VPN when an app needs to access a resource that requires that kind of connection. All of these changes make for a better experience when creating and using VPN connections. Family Safety has been completely rewritten in Windows 8.1 and transformed into a web service. 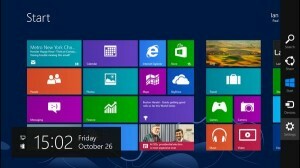 The features that existed in Windows 8 are still available, along with several improvements. Now it’s easy to link your family members and add or remove devices (including Windows Phone) monitored by Family Safety. You can set restrictions for the files that are downloaded, plus the games and apps that are installed on Windows Phone 8 devices. From the Family Safety website, you can manage everything without having to be at home. 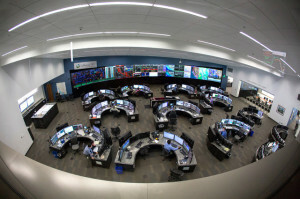 Also, reporting has been improved and Family Safety provides very granular activity reports so you have complete control over your child’s computing activities. This is a last-minute feature that wasn’t included in the RTM version of Windows 8.1, but in the updates that were provided during the global availability date. 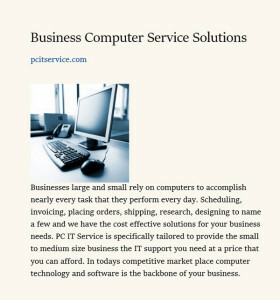 This Internet Explorer feature competes with renowned services like Readability or Evernote Clearly. Basically, when you load a page on any web site, you will see the Reading View icon in the address bar. If you click it, Internet Explorer reloads the page, eliminates ads and other distractions, and displays a clean version that’s very easy to read. Here you can see a preview of how web page looks in Reading View. What’s unfortunate is that Microsoft did not extend this feature to the desktop version of Internet Explorer 11. 3D Printing is a trend that’s gaining a lot of ground in recent years and for good reason: 3D printers are both fun and very useful, and they have the potential to revolutionize manufacturing. Windows 8.1 is the first commercial operating system to provide native support for 3D printing. What does this mean exactly? In Windows 8.1, you can print from both Windows Store apps and desktop applications. Developers can add 3D printing support to their apps with ease. Windows 8.1 provides a uniform feature set for 3D printing that’s compatible with today’s printers. Microsoft has published a very extensive blog post describing this feature here: 3D Printing Support in Windows 8.1 Explained. The 3D printing support doesn’t stop here though. 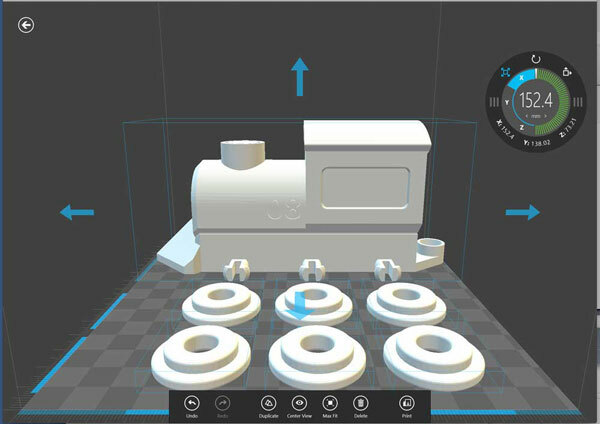 Microsoft also released an app named 3D Builder which can be used to view, prepare, and print your own 3D models. Now let’s talk about several potentially frustrating changes. First of all, there’s no right-click when using the Networks list. 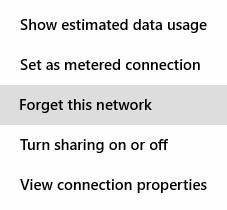 In Windows 8, when you pressed the networks icon, you could right-click on any of the connections listed and access useful configuration options, such as turning sharing on or off. Open File Explorer and expand the View tab. Go to Options > Folder Options on the right side of the ribbon. Go to the General tab and check the “Show Libraries” checkbox at the bottom of the window. Click OK.
Now, Libraries should show back up, right where they were in Windows 7 and 8. The only other difference is that Libraries no longer include public folders, which is a curious change, but one that may or may not affect you. Hit the link below to read more about the new change. A surprising change in Windows 8.1 your SkyDrive files are not fully downloaded to your PC or device. When you browse the SkyDrive folder in File Explorer, you’ll notice a new column named Availability. By default, all your files are listed as Online-only. What does this mean? Online-only files are only placeholders for your files. They retain some of the properties of the original files—their metadata, but not their content. The full content of these files is found on Microsoft’s servers. When you need to use online-only files, you use them as if they were normal files. However, before using them, Windows 8.1 downloads their content to make them available for editing—then, their status changes to Available offline. This behavior is due to a feature named Smart Files, described by Microsoft here. Smart Files are useful on tablets or laptops with very little free space available; however, most Windows 8.1 users are not tablet users and they do have lots of space available on their hard drives. Luckily, turning off this feature and making all your SkyDrive files available offline is as easy as flipping a switch in the Settings charm for the SkyDrive app. 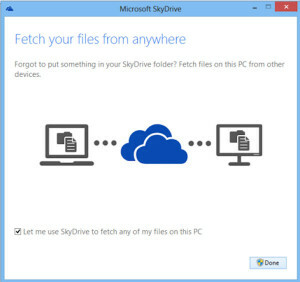 One of the features of the SkyDrive desktop client in Windows 8 was that it allowed you to fetch files from anywhere, including files that weren’t synchronized with SkyDrive. Unfortunately, SkyDrive no longer has a desktop client in Windows 8.1. SkyDrive has a Windows Store app and a synchronization service running in the background. Unfortunately, this means that the remote fetch feature is gone and you can no longer use it. Most users won’t miss it since they didn’t use it in the first place, but geeks and IT professionals will surely be unhappy about its disappearance. 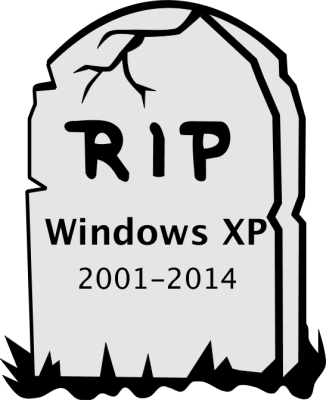 Extended support for Windows XP Service Pack 3 (SP3) will end April 8th 2014. You can argue that XP is an old operating system and anyone in their right mind should have upgraded years ago. But upgraded to what? Most home users may have in fact upgraded long ago and probably more than once with retail computers loaded with new OS and an abundance of add junk crap-ware and small amounts of RAM usually crash quickly. Businesses however mostly chose to downgrade to Windows XP that was available on new computers sold to business until January 31, 2009. 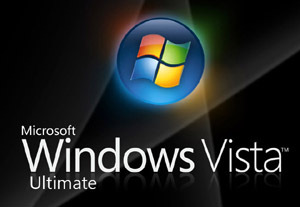 The first OS after XP, Vista released January 2007, was a flop and few wanted to upgrade and business stuck with XP. 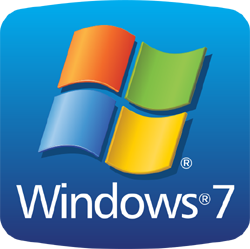 Windows 7 released in July of 2009 fixed the problems with Vista but its step up in hardware requirements made it a poor choice for upgrading and still left businesses wanting a better platform and many who did upgrade use Windows 7 with XP mode. Microsoft is now pushing Windows 8 as the obvious upgrade path which many users simply don’t want to use because Windows 8 is another Vista waiting to be fixed. 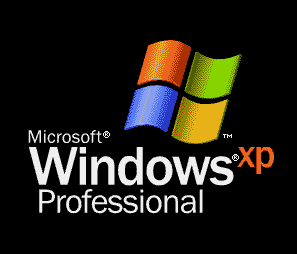 Even the argument that XP is old isn’t quite as simple as it sounds. Yes XP was released in October of 2001 and it was superseded by Vista in 2007 but XP came installed on new computers until 2009 which means there are a lot more viable machines running XP than you might think. Windows XP was the most widely used operating system in the world until August 2012 when Windows 7 finally overtook it that’s less than a year and a half ago. It also means that there is more software that needs real XP than you might think and drivers are always a problem for business machinery that need to be in service much longer than the life expectancy of a computer. Now we have situations that all our most personal information is out in the “cloud” of the new health care system. I was at a doctors office a few weeks ago who was still using an XP computer to enter my most personal medical information. Should I just hope these medical and professionals and other companies are going to pay for custom support after the end of XP. Yea right but that’s a whole other can of worms. For the rest of us Microsoft’s attitude seems to be that after 8th April you are on your own. 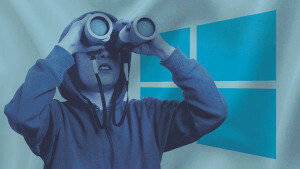 More than likely there will be a steady stream of malicious attacks on Windows XP which of course will not be patched. Any XP machine connected to the internet or other source of infection is not only a danger to itself but to the other machines connected to the local network. It is reasonable to speculate that soon after support is withdrawn some malware will make XP an easy back door into the network and facilitate some sort of ransomware that will make the removal of XP essential. Well this user will certainly miss Windows XP. I will keep one around to run the programs that I have found to be so useful for the last decade but it will be all alone in the world with no Local or Wide area network connection an oldy but goody that made computer OS history. But what about my Office 2003 oh no its dead too and that’s a whole other article. EXTRA $50 off Dell select Inspiron and XPS laptops $599 or above with free shipping! The extra $50 off promotion is over but here are some links to on going deals from Dell computers and electronics. You need to check these links often as deals change almost daily so if you have a new pc or home entertainment purchase in mind check these links for the best deals each day.